Throughout the year, in France and overseas, Montpellier scientific community participates to events, organizes international workshops and exhibitions. It will also meet the general public to raise awareness of tropical forests and the major role they play in our daily lives. To mark the International Year of Forests, the Paris city council and CIRAD are presenting “Tropical forests, discoveries and issues” as part of the exhibition-walk “Let’s go down to the woods”, in the Parc de Bagatelle from 28 May to 2 November, 2011. During the Paris International Agricultural Show from February 19 to 27 (Porte de Versailles) CIRAD has organized an exhibition on the theme "biodiversity, climate, sustainable development, wood energy, forest plantations, tropical woods, agriculture" and round tables on February 21 and 22 on the theme "Should we pay for tropical forests?" IRD organizes a series of conferences titled «Forests from here, Forests from elsewhere» at Marseille starting from February 5. Publication of a thematic internet kit on "Forests and human"
Montpellier township has organized the   3rd edition of the  « Biodiversity Festival» on May 20 and 21  (Esplanade Charles de Gaulle) on the theme of the forest. Most regional research and higher education institutes have participated. 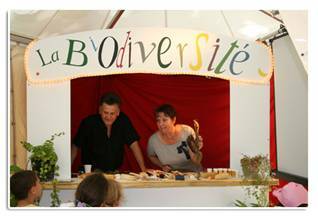 On this occasion, Agropolis International has organized for the second time the  "Biodiversity little theater" which aims to stage scientists working on this theme. Sustainable tropical forestry (SUTROFOR) -  Specialisation "Environmental management and policies for tropical forests"